It's August 1st and that means today is all about a brand new Farm Fresh Challenge at The Greeting Farm! As you know, a new challenge is issued at the beginning of every month over on the TGF blog and this time around it is... 'Friendship'. Friendship day is August 7th so this is the perfect time to create some cards for those special people that we are lucky enough to invite into our lives. 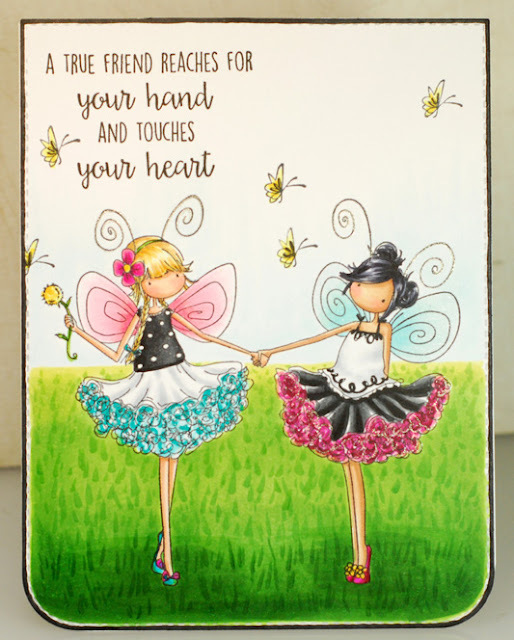 There are so many great images in the TGF store that work with this theme so get creative and show us your best friendship themed cards... playing along just might win you a $50 gift certificate! Ok, friends, I've got to run! Ok folks, time for me to scoot. Talk at'cha later! Things have been heating up in my neck of the woods so a lot of free time has been spent chillaxin' in the water just trying to keep cool. 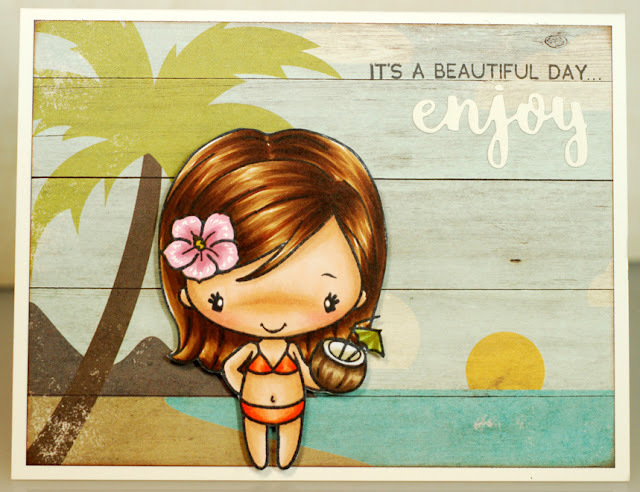 Makes me wish for a tropical oasis to escape to but since I don't see that happening any time soon I guess I'll just have to live vicariously through my stamps, LOL! Tropical Piper from Some Odd Girl fit my mood perfectly so I printed her out and got down to coloring this island beauty. 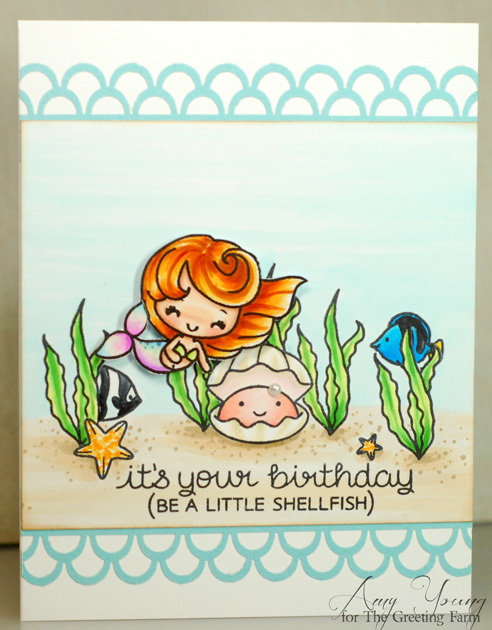 I also had fun getting creative with a watercolor background using an old Heidi Swapp mask that I've had in my stash for years. 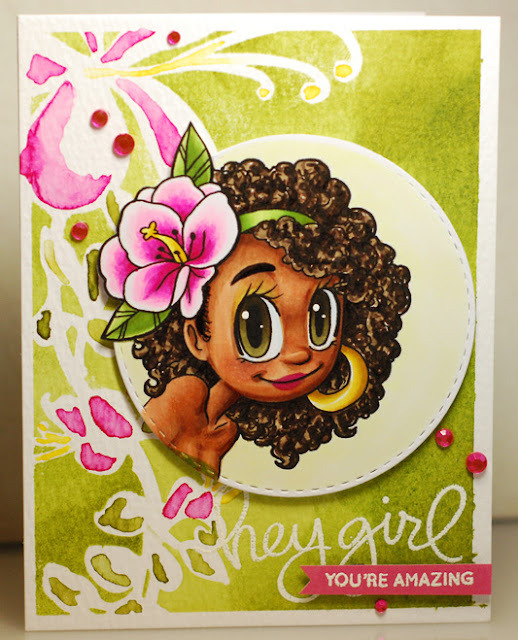 The flowers were too perfect a match not to use with Piper and it was a great challenge to match the Copics I used to the Distress inks in the background. 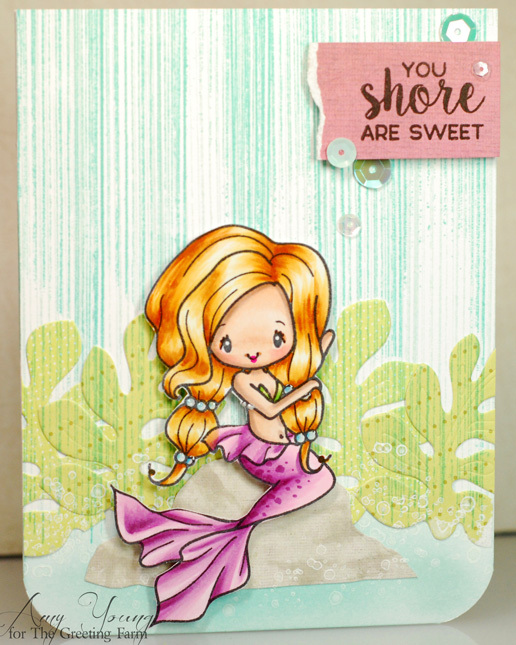 I'm so pleased with how this card came together that I'm going to enter it into the current SOG Facebook challenge, "Anything Odd Goes". Be sure to leave a comment on each designer’s blog, and then head back to The Greeting Farm Blog to let us know you completed the hop. You have until Sunday, July 24th at 12pm CST to leave your comments. We will announce the two random winners later in the week! For my card today I've inked up the sweet Santa from the Ho Ho Holiday set and a whole heap of gifts from three of the four sets. 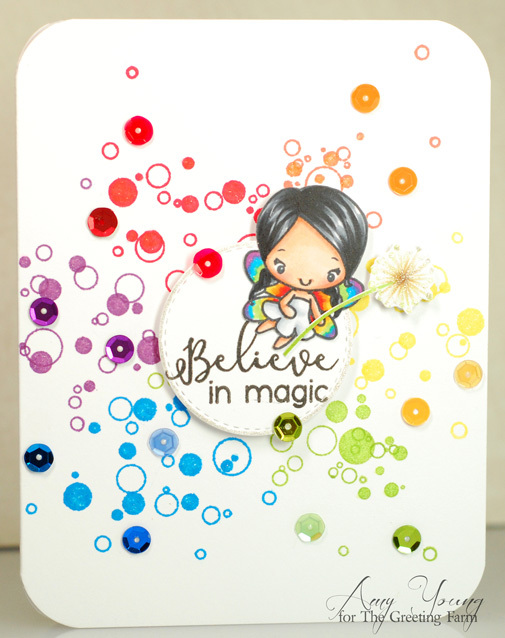 I contained most of the design inside the wonky stitched window die because I think it adds whimsy and a sense of playfulness to this clean and simple card. Well, we've made it to the fourth and final day of previews for the TGF July release and we've saved a super fun, interactive set for last. The stamp set is called Pop Out Xmas and the pop out refers to the way you can mix and match these stamps to add the Santa, Reindeer or Snowman to a variety of gift boxes or even stockings. For my card I chose to ink up Santa and a couple reindeer and pop each one into their own stocking. Once I had them in there they kind of reminded me of tree ornaments so I totally ran with the idea. I knew I had a Memory Box die that looks like ornament hangers so I cut some out of gold paper and added them to my stamped images. Then I just created a background that looks like the inside of a Christmas tree by rubbing spots of colored inks on with a cotton ball and then stamping pine branches right over them. The TGF blog is totally poppin' with inspiration from my fellow Farmers today so be sure to check that out. 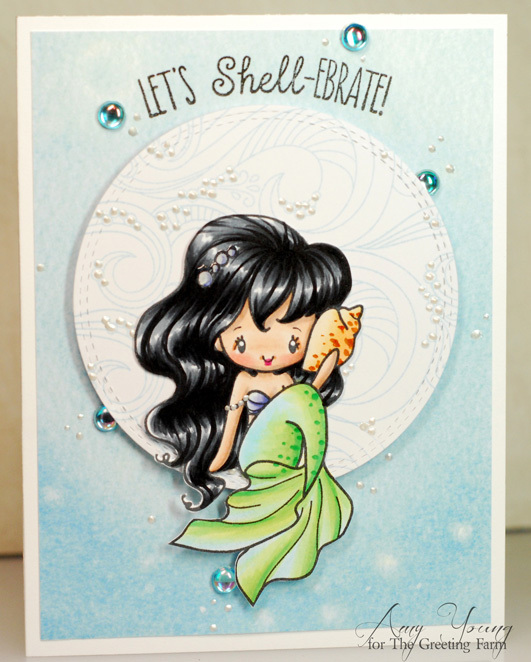 And come back tomorrow for a blog hop and chances to win the new release! Here we are at day three of the Greeting Farm July release and I have to admit that this set is my favorite of the bunch. 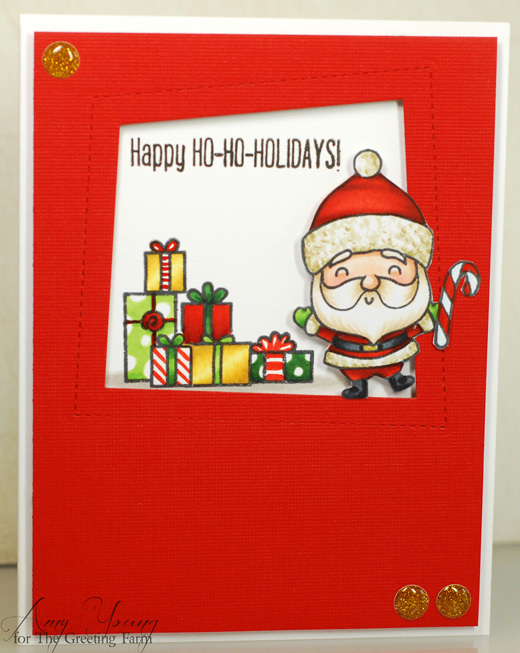 It's called Ho Ho Holiday and there are three darling elves, a super cute Santa, great sentiments and fun extras all included in this set. 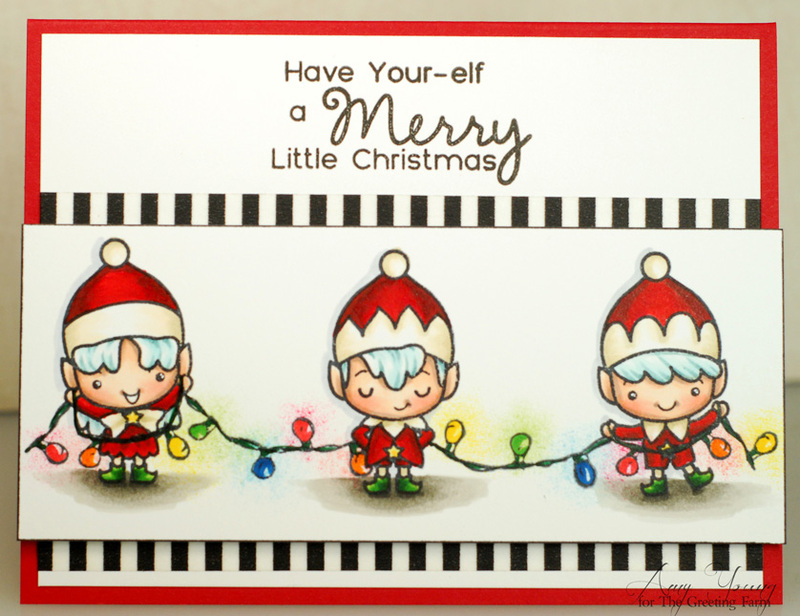 For today's card I chose to ink up all three of the elves to create a merry scene of them preparing to decorate Santa's workshop. 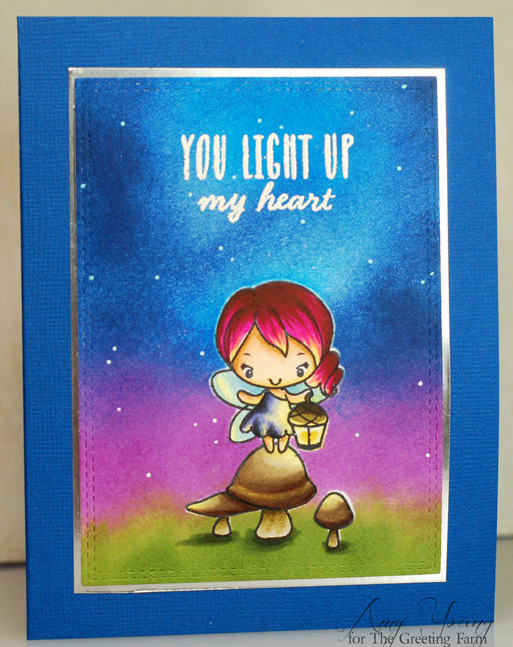 I did borrow a string of lights stamp from an old Karen Foster set to get this look but the lights could have just as easily been drawn in free hand. Once I had the image colored I grabbed small cotton balls and dabbed coordinating ink colors around each bulb to make them look like they are glowing. 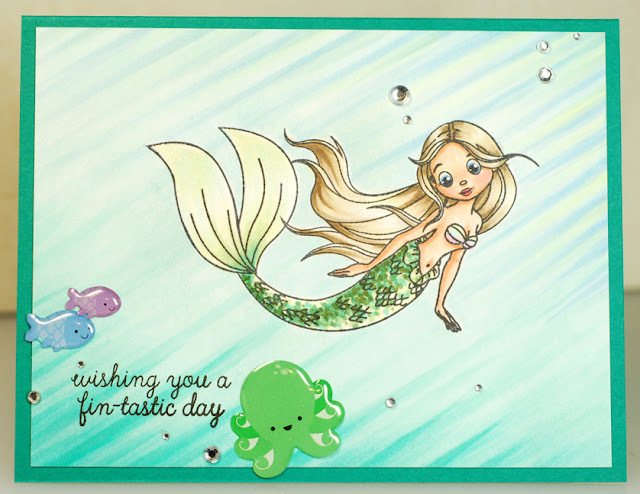 Welcome back to day two of the TGF July release where we are previewing four new clear Christmas stamp sets. 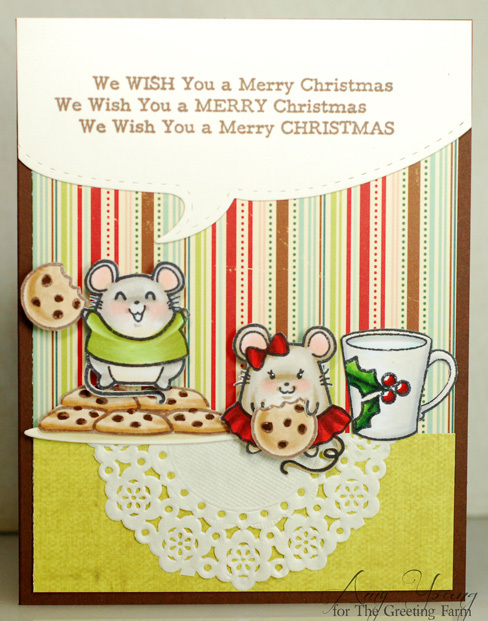 Today Let's Mingle is in the spotlight and this set includes a whole slew of festive mice along with some cookies, gifts and sentiments. I couldn't resist stamping up a whole plateful of cookies for these two merry mischief makers to raid. Then I realized that a cup of milk needed to be left for Santa too so I grabbed the I Love Mom set, wiped away the wording on the cup and replaced it with this holly motif from another upcoming Christmas set. 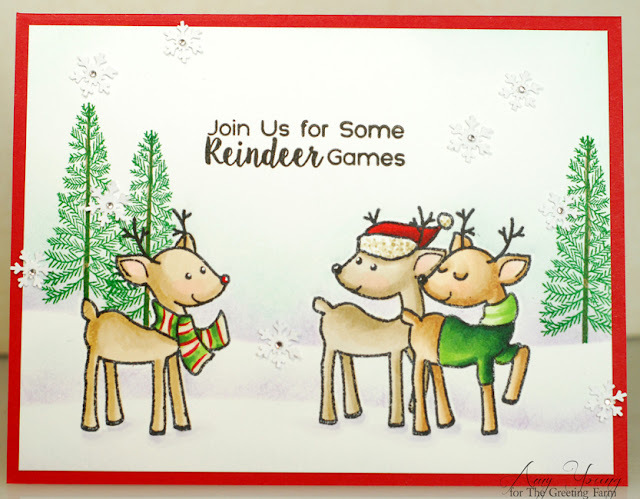 I wanted to use this big speech bubble border die so I actually chose a larger sentiment from the oldie but goodie Holiday Blessings set and I think it works pretty great with these excited and eager Christmas critters. Now scurry on over to the TGF blog to see all the Christmas magic my fellow Farmers have been creating! Now I know that we are currently smack dab in the middle of summer but it's never too early to start planning for Christmas card making. 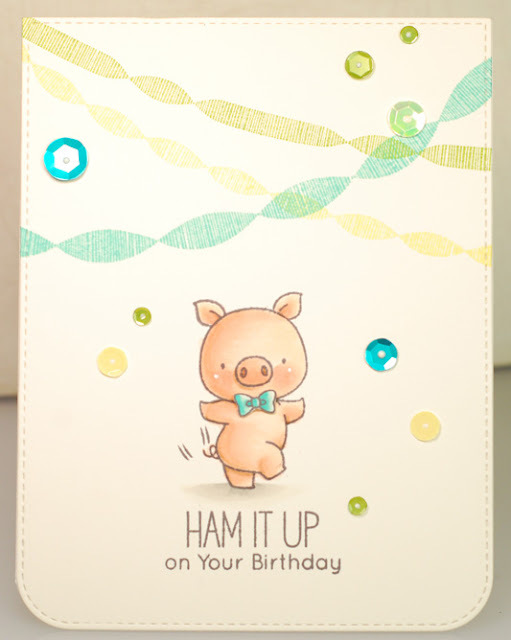 So today we are kicking off previews for a special Greeting Farm Christmas release of four brand new clear sets. There are so many adorable Christmas cuties coming, and they will all be available for purchase on Friday, July 22 in the TGF store. 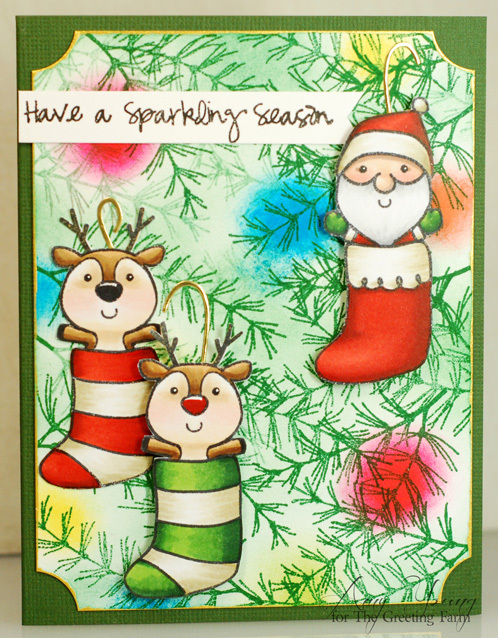 First up is the Dashing set that features these great reindeer as well as some unique sentiments and fun extras. I couldn't resist doing a bit of masking to get all three on my card to create a scene of Rudolph finally being invited to join some reindeer games. Aren't they just darling? Simple and quick to color yet so full of character and charm. Now be sure to check out the TGF blog to see what my fellow Farmers have created with the Dashing set and don't forget that at the end of the week there will be a chance to win some of these new stamps too! 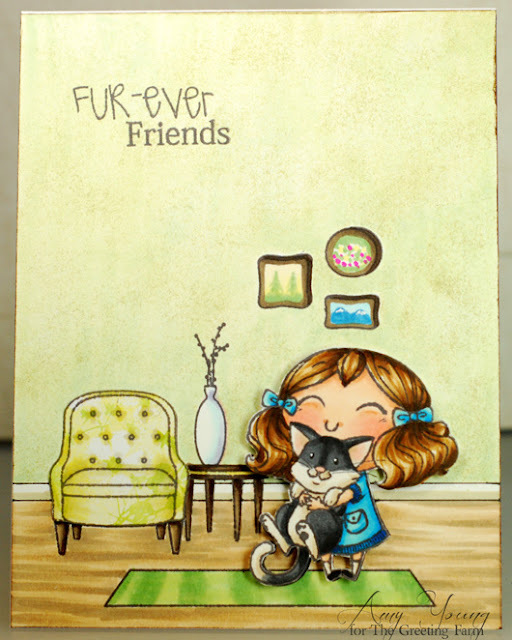 Last Friday I had the July Super Secret Stamp Club stamp show up in my mailbox and she is an adorable new Anya called Styling. I love everything about her but while she really is very stylin' her outfit was a bit too formal for the summer themed cards that I'm currently making. So I decided to do a head swap and give Styling a warm weather makeover. Dress Me Anya's body and clothes from the Summer Wardrobe set were just what I needed. I even took it a step farther and gave her some cool shades and an ice cream cone to help beat the heat. 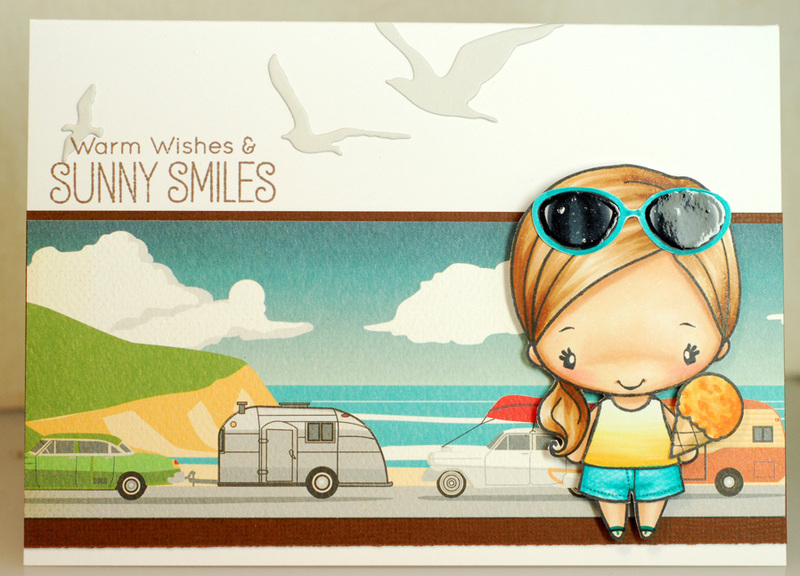 The paper is from the new Great Outdoors collection and I chose to use the strip that looks like Anya is traveling down the coast to sunny California. Free and easy down the road she goes, LOL! Hi-ya! It is my turn to post over on the TGF blog today and I am sharing another card that I made using the Little Fairies set, which is currently back in stock for anyone who missed out the first go round. Ok, time for me to scoot. Have a good one! Ok, time for me to get ready for the day. Hope your weekend is a crafty one my friends!